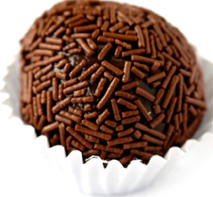 Brigadeiro is a simple Brazilian chocolate fudge candy created in the 1920s. It is named after Brazilian airman Brigadeiro Eduardo Gomes. It's commonly served with soda, coffee or milk. In a heavy saucepan, mix the milk, cocoa powder and butter. Stir to dissolve the chocolate. Put over low heat and stir constantly to avoid formation of lumps. Butter your hands and roll the mixture into small balls (around 2cm in diameter) and roll them over the chocolate sprinkles. Alternatively, you can use two metal spoons to shape the candies. You can substitute the cocoa powder for 100g of baking chocolate. If you want a lighter candy use powdered chocolate (such as Nestlé Quick). You can also put raisins or nuts in the center of the candy. You can decorate with powdered sugar instead, or cocoa powder. This page was last edited on 21 March 2019, at 01:56.